McNett Corporation proudly introduces Sea Quick Anti-Fog Spray to its line of world famous anti-fog products! Our dynamic new spray formula has been developed at the request of many of our customers and it works great with one application! New spray formula anti-fog for dive masks. Superior anti-fog performance with one application. Sea Quick lasts and lasts and lasts! Available in 2 oz. Bulk, Blister Pack and Private Label. 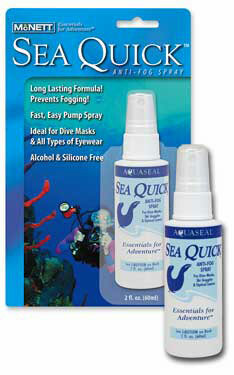 For Use On dive MAsks: Spray Sea Quick™ onto each lens surfaces. Spread gently with fingertips. Rinse immediately. For Use On: Sunglasses, Eyewear, Face shields, Ski Goggles, Hockey masks, Paintball Goggles, Night vision goggles, Binoculars and more: Before use, to avoid scratches, lens should be free of dirt and debris. Spray onto all lens surfaces. Immediately buff until clear using gentle circular motion with MicroNet™ Microfiber Cloth or soft lens cloth.